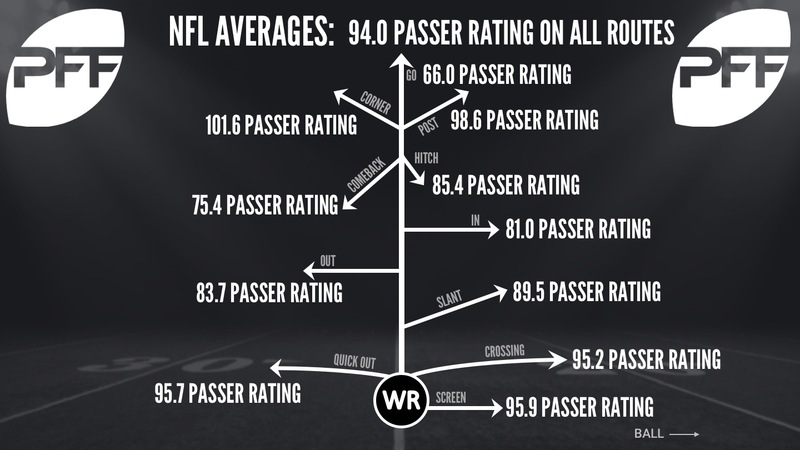 Over the course of the next month, we’ll take a look at the top five receivers from the 2017 season on each individual route, by their passer rating when targeted – their WR Rating – on each specific branch of the route tree. We’ve already looked at routes targeted at or behind the line of scrimmage, and today we trek past the line of scrimmage. 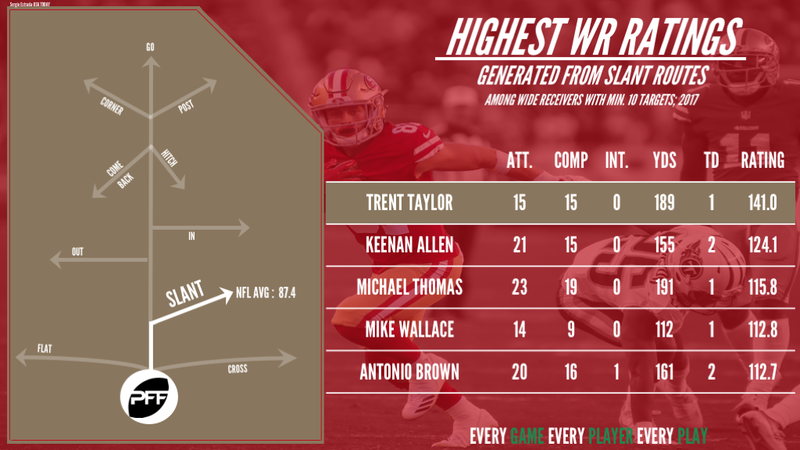 The rising receiver performed historically well on slant routes in 2017 and ended the season with 15 catches from 15 targets for 189 yards and one touchdown, resulting in a WR rating of 141.0. Since we started tracking the route data for every player on every play of every game, he is the only receiver with at least 15 targets in a regular season to field a perfect catch rate, the only receiver to grade positively on at least 85.0 percent of his targets and he’s the only receiver to convert over 80.0 percent of his targets to either a first down or a touchdown. That’s pretty good. The combination of Allen’s size, speed and athleticism makes him a nightmare to defend on slant routes, and that certainly showed last season. The Chargers No. 1 receiver brought in 15-of-21 slant targets for 155 receiving yards and two touchdowns. His 11 receptions that resulted in a first down ranked fourth among the league’s pass-catchers and 66.7 percent of his targets were positively graded – the league’s fifth-best mark. In 16 regular season games, Thomas was targeted on 25.9 percent of quarterback Drew Brees’ pass attempts, which makes him the most targeted player of Brees’ career within the PFF era, and that speaks volumes to Thomas’ talent. 23 of those targets came via the slant route, and he caught 19 of those targets for one touchdown. All told, he racked up 191 receiving yards and 89 yards after the catch, both of which ranked fourth among receivers with at least 10 slant targets. 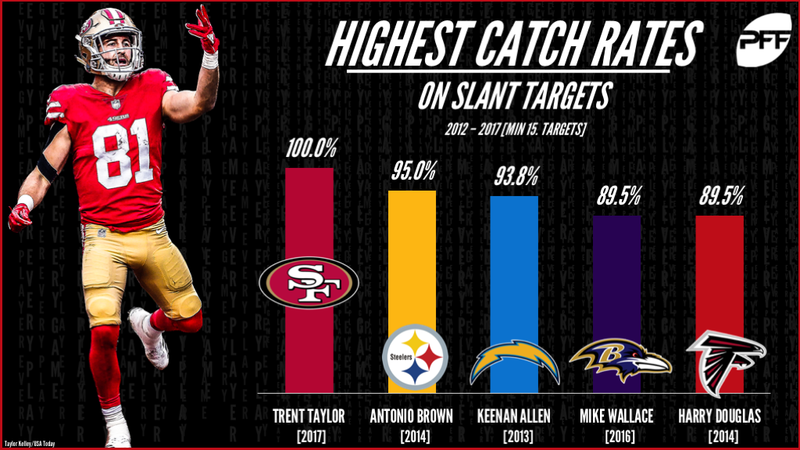 Wallace notably ended the 2016 season ranked first on this list after he generated perfect WR rating on his slant targets, and while he did see a slight drop off in 2017, it wasn’t by much. All told, he hauled in 9-of-14 targets for 112 receiving yards and one touchdown and his 12.4 yards per slant reception ranked seventh among receivers with at least 10 targets. Arguably the best receiver in the game, Brown’s 2017 performance took him one step closer to securing that title. The slant route accounted for 20 of Brown’s 155 regular season targets and he caught 16 of them for 161 yards and two touchdowns. His catch rate of 80.0 percent was good for fifth among receivers with at least 10 slant targets and 65.0 percent of his slant targets were positively graded, which was the league’s seventh-best mark.